(NaturalNews) The "affordability delusion" of Obamacare is set to be obliterated following the decision of a federal judicial panel which declared that most of the subsidies currently being paid toward individual health insurance policies are illegal. This decision has been characterized as a "devastating blow" by even the biased mainstream media which has incessantly pushed the politics of Obamacare. "The case, Halbig v. Burwell, is one of the first major legal challenges that cuts to the heart of the Affordable Care Act by going after the legality of massive federal subsidies and those who benefit from them, reports Fox News. (1) "The ruling, though likely to be appealed, could threaten the entire foundation of the newly devised health care system." The Affordable Care Act states that such subsidies can only be paid to enrollees who sign up through state-run exchanges, not the federally-run exchange. But the Obama administration, we all now know, believes it does not have to follow any law whatsoever and so has been issuing subsidy payments that are blatantly illegal under the law. 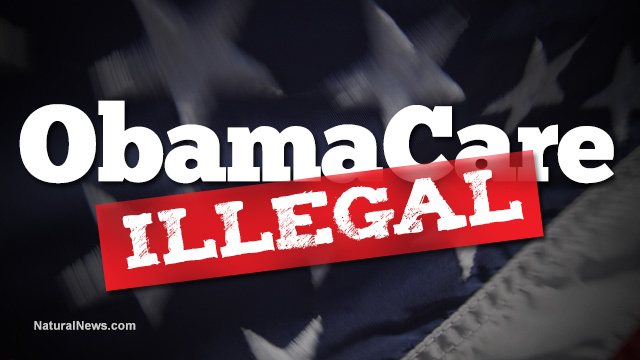 That's precisely what the federal courts ruled today: Obamacare as currently being executed is illegal. The court's decision stated: "The fact is that the legislative record provides little indication one way or the other of congressional intent, but the statutory text does. (It) plainly makes subsidies available only on exchanges established by states. And in the absence of any contrary indications, that text is conclusive evidence of Congress's intent." The Obama administration and all its apologists, however, have now taken up the absurd position that "laws means whatever we say they mean, not what's actually written." Obama administration officials and members of the leftist media are now attempting to claim that the law's words are a "mere technicality" and therefore don't count. The federal court justices had a strong rebuttal to that idea, stating in their decision, "...to say that enacted legislation, on its own, does not command our respect [is] an utterly untenable proposition." Laws mean what they say, in other words. Otherwise we are not a nation of laws but rather a nation of wishy-washy intentions dictated by a tyrant who invents his own rules as we go along. But that's the way the political left wants it, of course: the laws be damned, Obama is their King and whatever he says must be followed even if it's blatantly unconstitutional or illegal. "Today's decision rightly holds the Obama administration accountable to the law," wrote Sen. Orrin Hatch in a statement. (2) "As it has on so many occasions, the Obama administration simply ignored the law and implemented its own policy instead." Sen. Ted Cruz also chimed in, saying "The D.C. Circuit's decision today in Halbig v. Burwell is a repudiation of Obamacare and all the lawlessness that has come with it. This is a significant victory for the American people and the rule of law, but we must not rest." Is America a nation of law, or an empire with a King? The real question in all this is whether America is a nation of law or an empire ruled by a King? There is no debate about the text of the law itself: it clearly says subsidies to enrollees of federal exchanges are illegal (i.e. not allowed by the law). But ignorant Obama supporters -- who have no clue about how tyranny rises from good intentions and ultimately leads to genocide -- are now insisting that laws don't matter anymore and that America is now a nation run by a tyrant King who alone decides which laws to enforce, ignore or invent out of thin air. Be warned that this is the path to tyranny, and Obamacare apologists who defend this lawlessness are accelerating America's disastrous fall into despotism and lawlessness. If Obama wants to fix the law and change what it says and means, he needs to go to Congress and encourage them to take appropriate action. The idea that Obama should simply "bypass Congress" whenever he feels like it is radically dangerous, and it's the kind of idea that once gave rise to the National Socialists of Germany; a part named the "Nazis."